Porky Pig as Friar Tuck enjoys a laugh at Daffy Duck's expense. Based on the Merry Melodies cartoon Robin Hood Daffy. Porky's detailed base features elements from the short's river setting! 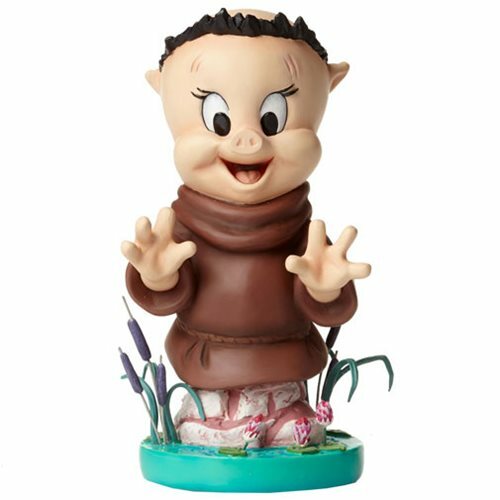 Porky Pig dressed as a Friar enjoys a laugh at Daffy Duck's expense in this Looney Tunes Porky Pig as Friar Tuck Grand Jester Mini-Bust based on the hilarious Merry Melodies cartoon Robin Hood Daffy. Porky's detailed base features elements from the short's river setting. Made of stone resin, this fun piece measures roughly 6 3/4-inches tall x 4 1/4-inches wide x 3 1/2-inches long. Daffy Duck sold separately. Ages 13 and up.